Mark sent a recent email complaining the previous biplot code not working. Though I was not able to replicate his errors,but from the error message figured the error was due to the PCA numbers supplied. That reminded me of the simplification task that I intended to do on the previous version to make it work like it works in matlab. 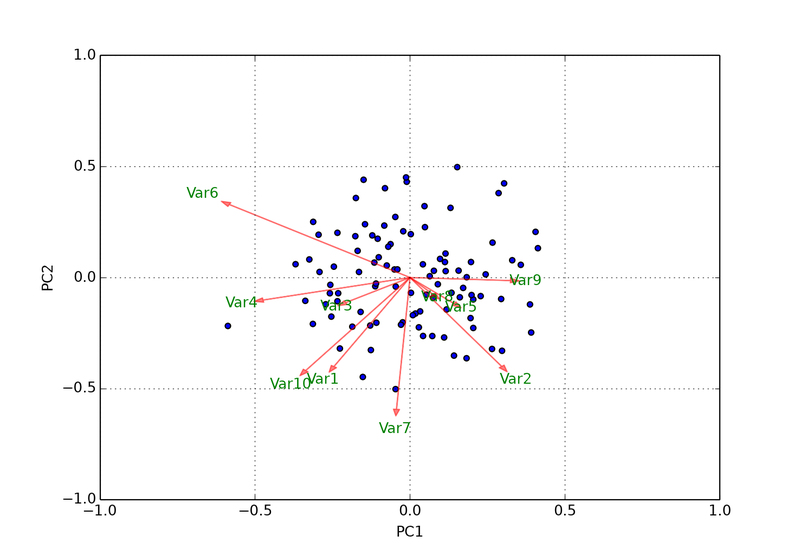 No dependency on PCA data structure, send to variables, scores and coefficient and plot the biplot. So here’s simplification,it works like matlab. This entry was posted in python, technical and tagged biplot, code, pca, python. Bookmark the permalink. ← How to choose a book vs how to google? The results of a PCA are usually discussed in terms of component scores, sometimes called factor scores (the transformed variable values corresponding to a particular data point), and loadings (the weight by which each standardized original variable should be multiplied to get the component score). The biology essentially plots two scores and the arrows are the components. Hope this helps. Please look at PCA on Wikipedia to understand better.